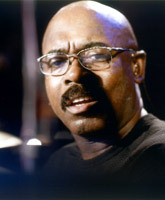 Drummer/composer/producer Harvey Mason (born February 22, 1947 in Atlantic City, New Jersey) first showed his penchant for greatness, distinctive technique and innate sensitivity in the late 1960's performing with jazz legends Duke Ellington and Erroll Garner. His recording career began in the early years of the Blue Note jazz crossover explosion and continued with groundbreaking performances and compositions with Herbie Hancock and the Headhunters. One of the world's premier drummers, Mason has earned numerous Grammy nominations including one for Best Contemporary Jazz Performance. He has worked with many jazz and fusion artists such as Bob James, Lee Ritenour, Donald Byrd, Johnny Hammond, Bobbi Humphrey and Gary Bartz. He is featured on George Benson's 1976 album, Breezin'. More recently, Mason has sort of come back to his jazz roots, and produced two superb piano trio albums (With All My Heart and Changing Partners) enlisting the help of top-notch pianists including Kenny Barron, Chick Corea, Fred Hersch, Monty Alexander, Bob James, Cedar Walton, Brad Mehdlau, Mulgrew Miller, Dave Grusin, Herbie Hancock and Hank Jones, among others.